Hi everyone! 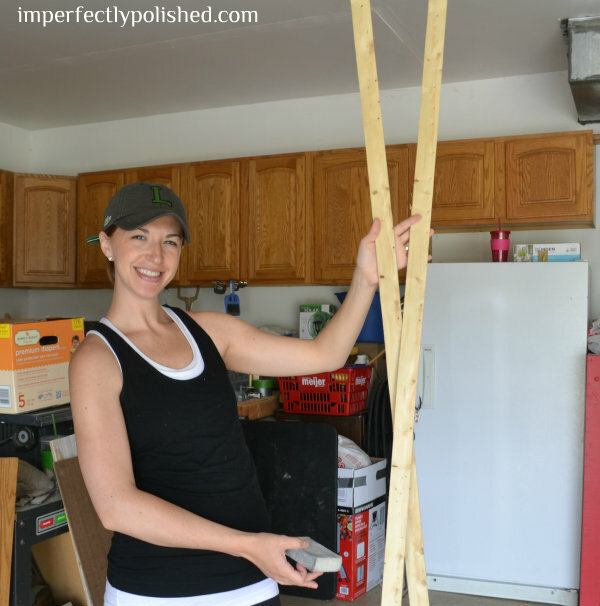 I have a really fun, inexpensive project today! 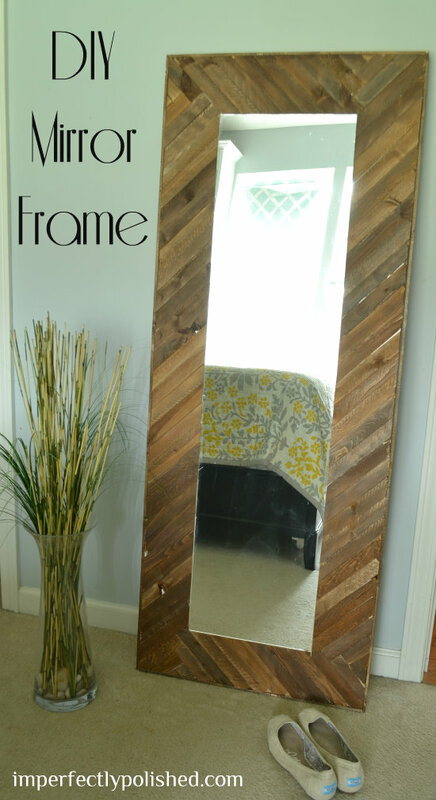 I dreamt up this fun wood mirror frame a few weeks ago and Mike helped me figure out how to make it happen. 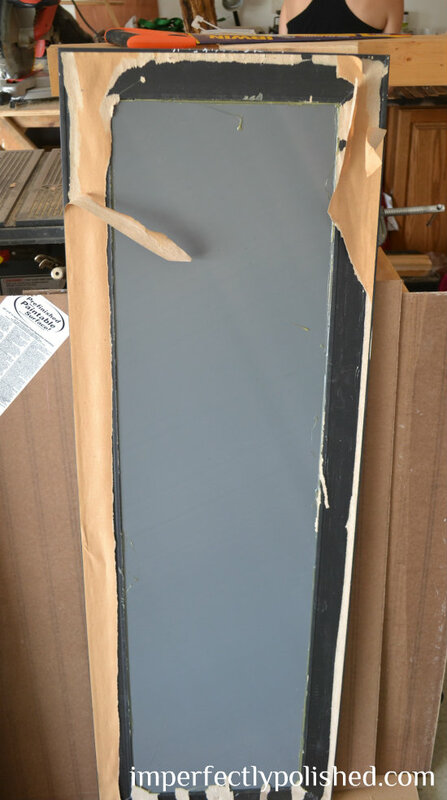 We started by taking a cheap Walmart mirror we had laying around and stripped the back and frame off. Then we grabbed an old door that used to serve as a desk in our kitchen nook to attach everything to. A piece of plywood or any other board that is big enough would work also. 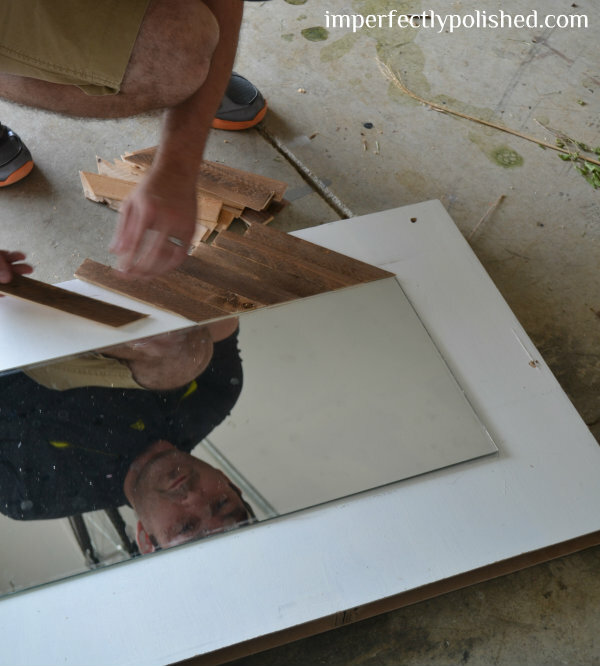 We centered the mirror and used silicone to attach it to the door. 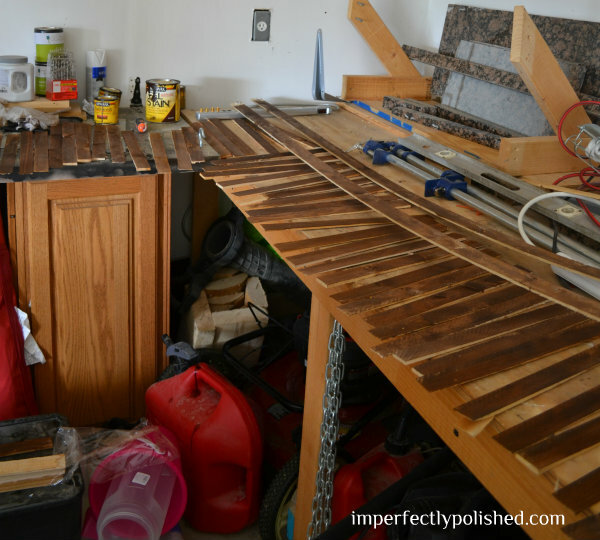 While that dried, we laid out the shims and stained them all. We used about a bundle and a half of shims. We also used 2 pieces of wood lathe. These are about $1 a piece and you can find them at any home improvement store. 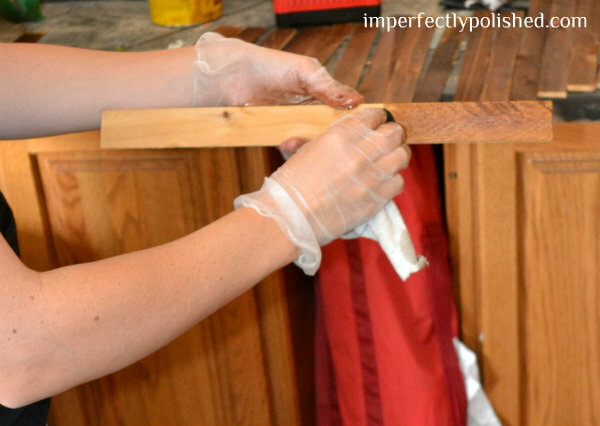 I gave those a really quick sanding along the edges to remove any splinters and stained them as well. Once all the stain had dried, I took a stack of 4-5 shims at a time and cut them at a 45 degree angle using the miter saw. 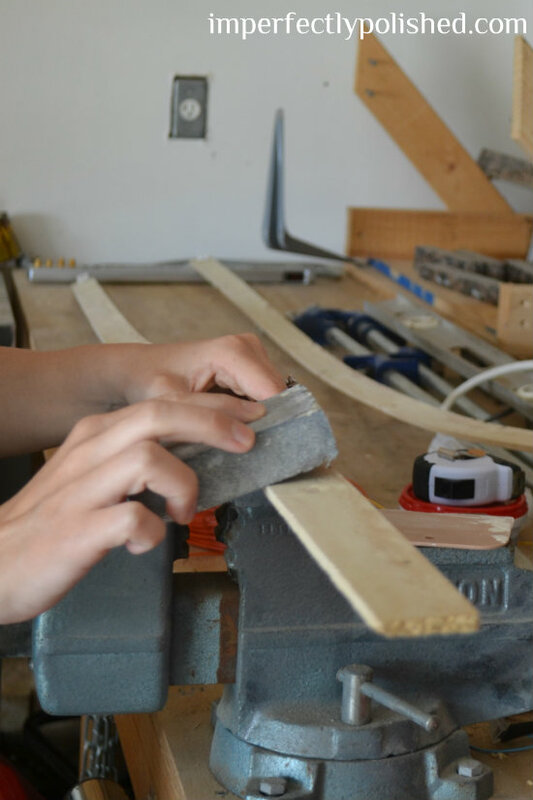 You can also use tin snips to cut shims as well because they are pretty thin. 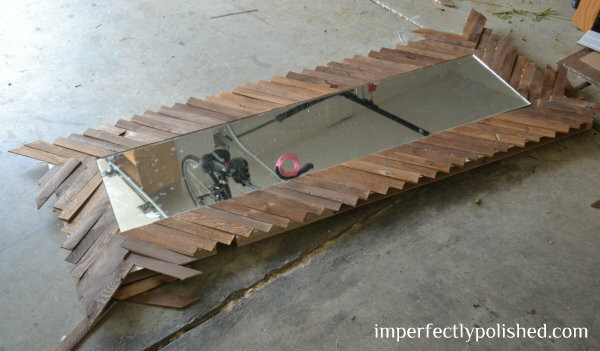 Next, we started laying out the shims around the mirror in the design we wanted. The sides were simple, but the top and bottom took a little more work. It was sort of like a puzzle, just piecing shims together until it looked good and covered everything. 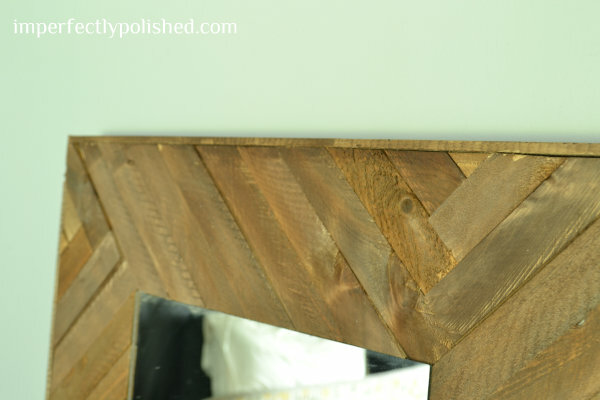 Once we had a pattern we liked, we glued them in place leaving some overhang over the edges. After the glue dried, Mike used a jigsaw to cut the excess off the edges. 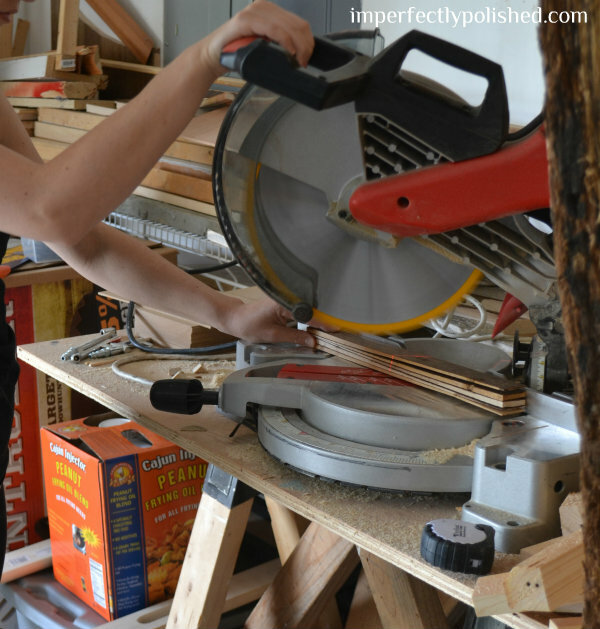 Once all the excess was cut off, we went back and used a nail gun to attach the wood lathe to the sides and top/bottom to finish off the door. If I were to do this project over again, I would have added the wood lathe first and then the shims. Trimming the shims at the end so you can’t see the edge of the lathe. 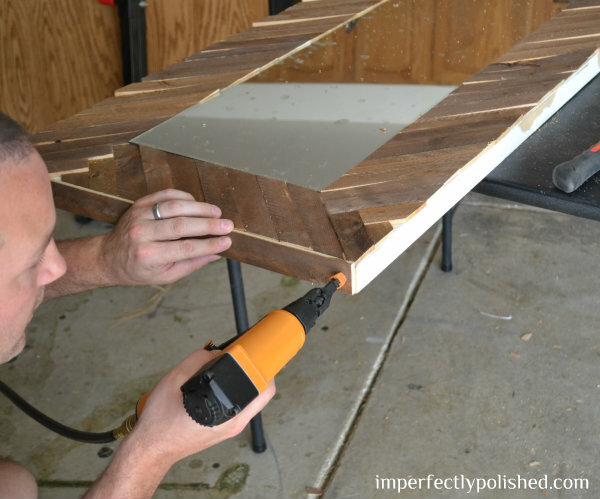 I would also suggest painting or staining the wood you use as a base so you won’t notice any cracks between shims. We went back through and filled in any gaps we had between shims or on the corners with extra shim pieces and set up the mirror. 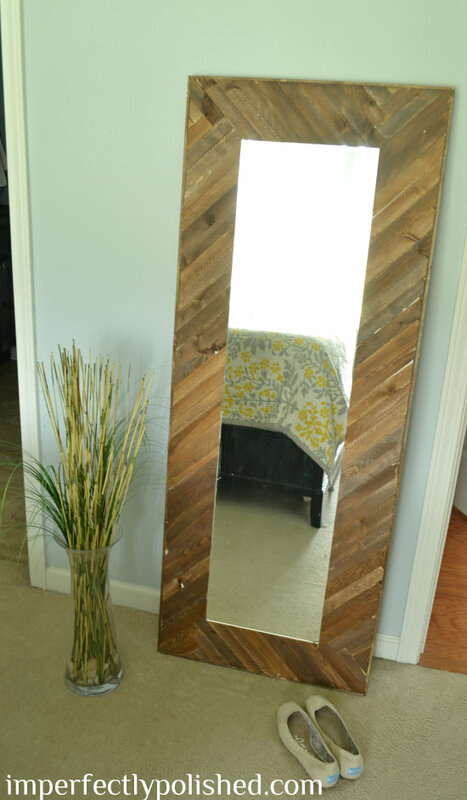 Not bad for $10 and some scrap wood, huh? 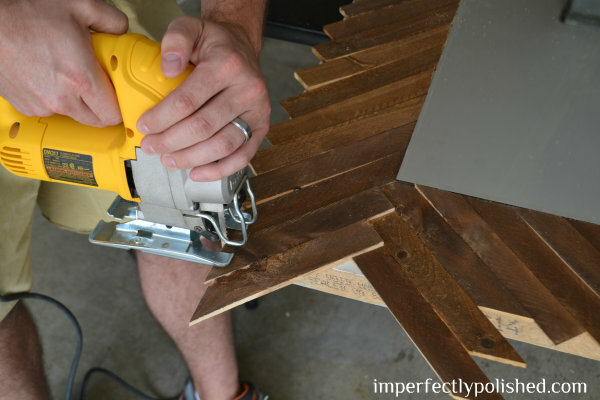 What do you think of using shims for decor? This looks SO cute! It definitely looks like it came from a catalog! PINNING! I popped over from Home Stories A to Z-thanks for sharing! Aww thanks so much, Abby!